So far, this year’s winter has been a mixed bag. Depending on where in the country you live, you’ve either: seen an unusual amount of early season snow, enjoyed a dose of unseasonable warmth through the holidays, been inundated with flooding, or found yourself caught amongst wildly fluctuating temperature ranges on a day to day basis. 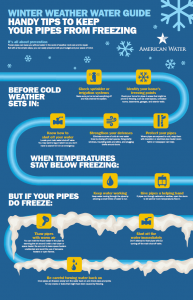 Now that January is really coming in with full force, and dropping temperatures approaching fast, it’s likely to be your last chance to not be put at risk for frozen pipes in your home, and the costly plumbing repairs that come along with them. 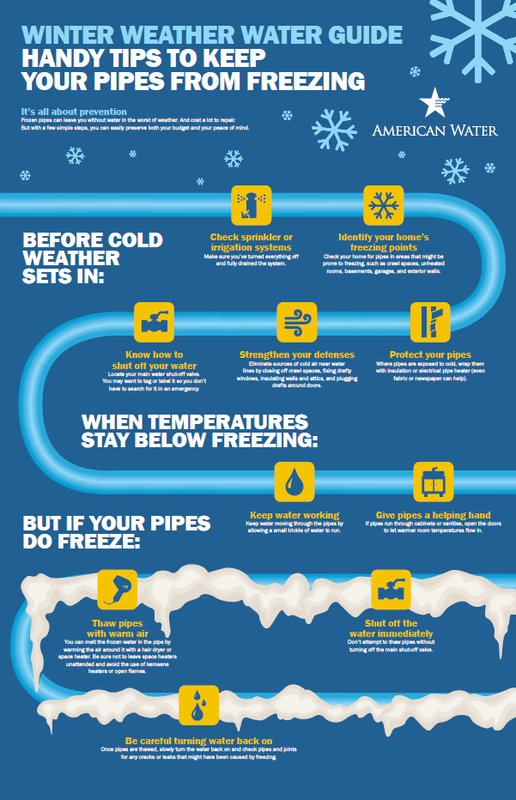 To avoid the challenge of frozen or bursting pipes this winter season, prepare your home by following these tips and finding out more via this infographic . Look around your house for pipes that are not insulated and insulate them. Electric heating tape can be an effective and inexpensive way to keep pipes above 32 degrees. You could also use pre-molded foam-rubber sleeves or fiberglass insulation, available at most hardware stores. No matter what method you use, please be sure to read and follow the manufacturer’s directions to avoid a fire hazard. Seal up cracks and holes in outside walls and foundations, particularly where cable TV or phone lines enter the house. A quick once-over with a caulking gun can help keep cold away from pipes. And don’t forget to make sure your water service provider and your other utility companies have the correct phone number to reach you in the event of an emergency. As more of us are opting to use a cell phone in lieu of having a home phone, it is essential that you register that number with your utility companies. American Water customers can update their contact information and also manage their account information online at My H2O Online.